As fall begins in the Catskill mountains, I am reminded of Robert Henri’s insistence on being aware of the dominant color of the light which illuminates a landscape (or a studio for that matter). 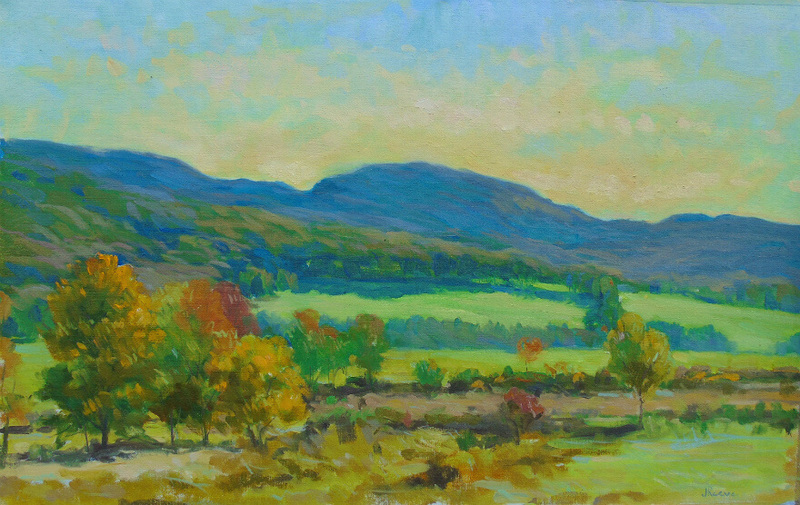 Autumn is a challenging season to paint as the foliage changes to brilliant colors. In a single composition, one can have various trees with a high chroma – red, red-orange, orange, orange-yellow, yellow, yellow-green seen against blue or violet hills. 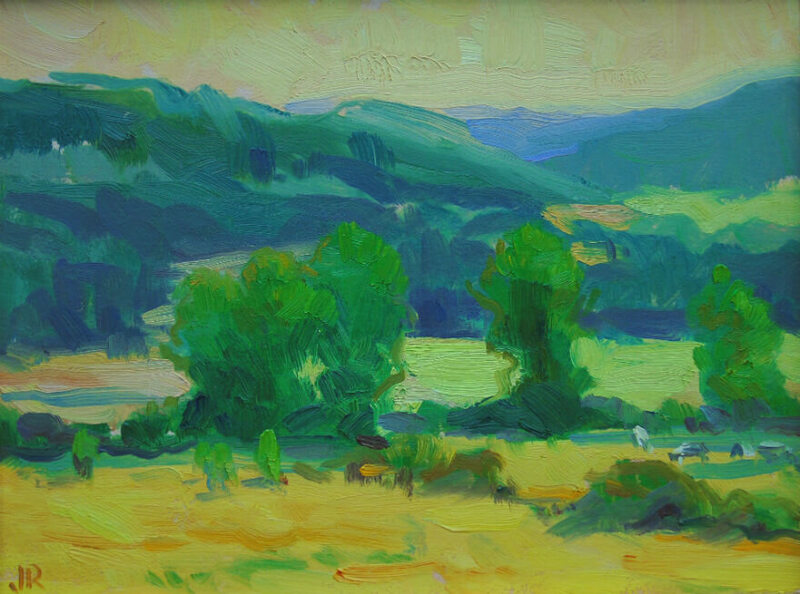 These colors can easily clash or appear to lack atmosphere in a composition. It is important to find the balance yet maintain the integrity of the visual experience. This year, I painted an expansive farm field at the Peter’s Farm up the road from my house four times from slightly different angles. It is one of my favorite spots, locally, to paint. My goal was to achieve a unity of effect, harnessing the various colors under one dominant color. This dominant color is called by Henri, the super-color. It is dominant because it is the color of the light from the sun as it passes through the atmosphere. This color permeates all other colors. The American landscape painter, Edgar Payne, used to locate this color and premix it on the palette. Then he would add this color to all of the local colors in the composition. This works very well. It creates neutrals where a complementary color is contained in the local color. Therefore, one achieves a simple unity that is held together by the super-color. My first study (below) followed this method strictly. Although my painting felt very successful, with certain dominant colors this method, at times, created too much neutrality and I lost some of the brilliance that I was after. So in my second study, I added the super-color as a premix to all receding objects, which appeared to be slowly engulfed in the atmosphere and left those that were closer more as I visually experienced them, still being conscious of that dominant color. But the foreground still called for more unity. In order to tie the foreground to the background, I added a secondary dominant color that accounted for the reflected light emanating from the dome of the sky. This is usually predominantly bluish, but in the fall this changes and often times is the complement to the dominant color. This addition of reflected lights on the top planes and into the shadows complemented the dominant color creating more variety in the unity of the space. Because at times, the complement could be used in the reflected lights, it visually created a greater dynamic feeling of color and the sensation of illumination. This is ultimately the goal. My last painting (the top image) brought all these investigations together combining the dominant super-color as the main light source with a secondary color describing the reflected lights. The dominant super-color was an orange-yellow with a violet red (visually a red-orange but slightly pinker) and for the reflected lights, I used a green-blue. And this really worked, the RO balanced by the GB. So the image contained a unity on two levels and therefore appears balanced.